When I started using Instagram for my blog, it began consuming my time. I was sharing to my IG story all the time and taking 30-45 minutes to plan a post: picking a picture, writing the perfect description, finding hashtags, etc. etc. 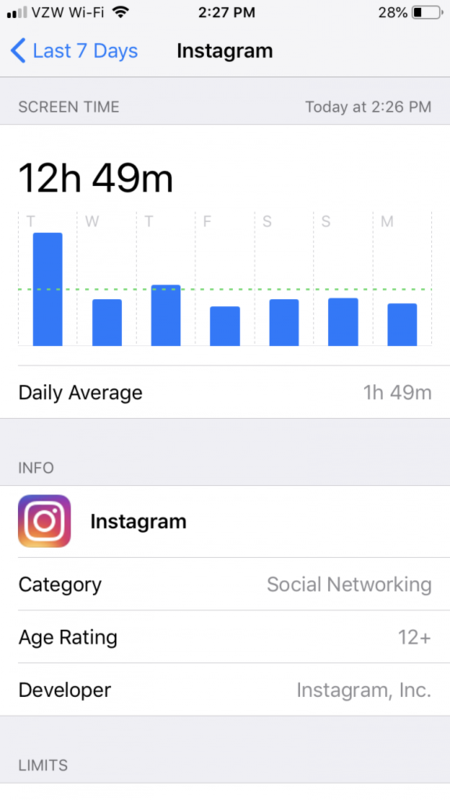 One day last week, I decided to check my iPhone screen time settings and I was appalled. I was spending 3 hours per day on Instagram. Gaahhhhh! So, I decided to find new ways to help me spend less time on Instagram while still posting quality content. Let me show you! 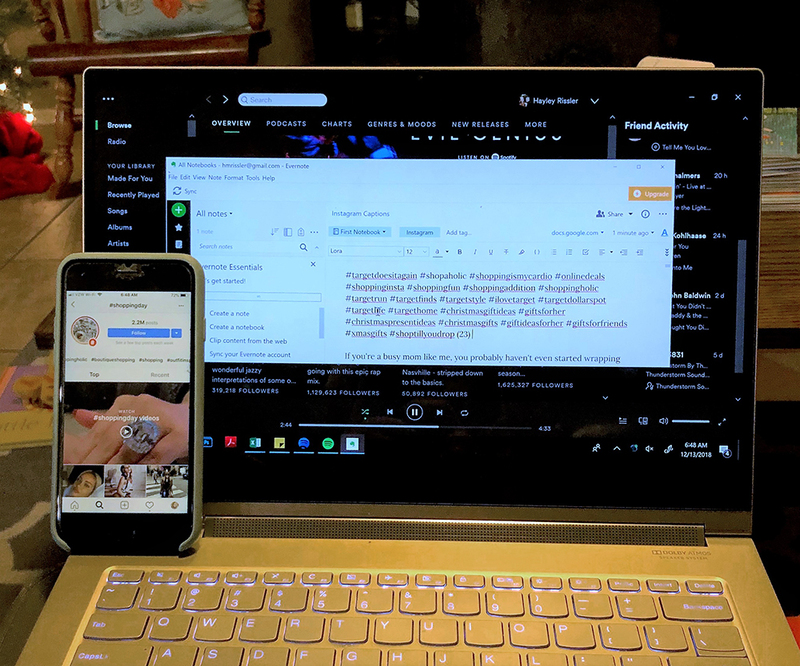 I’m a lot faster typing on a computer than on my phone – aren’t you?! 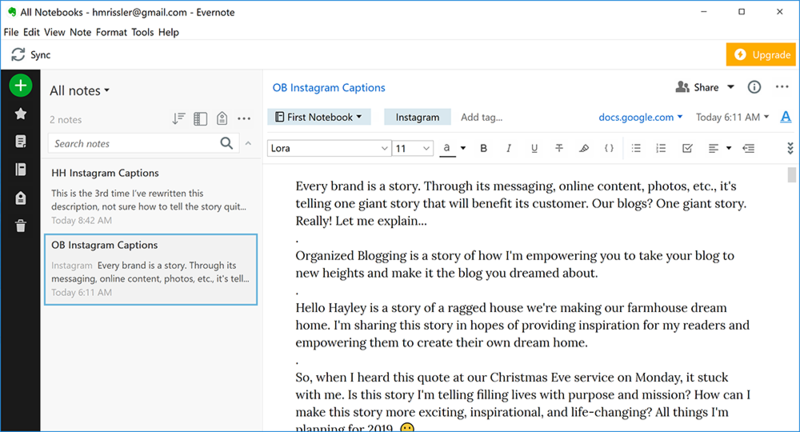 I downloaded Evernote (free!) on my computer and phone and use it to type up my Instagram descriptions. I type it up on my computer, click “Sync,” then open the mobile app and it’s all there! This step alone has cut the time it takes me to post in half. Another thing that’s helped me save time is keeping all my regularly-used hashtags in a spreadsheet. I group them by categories based on the content of my post and I can easily copy and paste them whenever I need ’em. Super convenient! 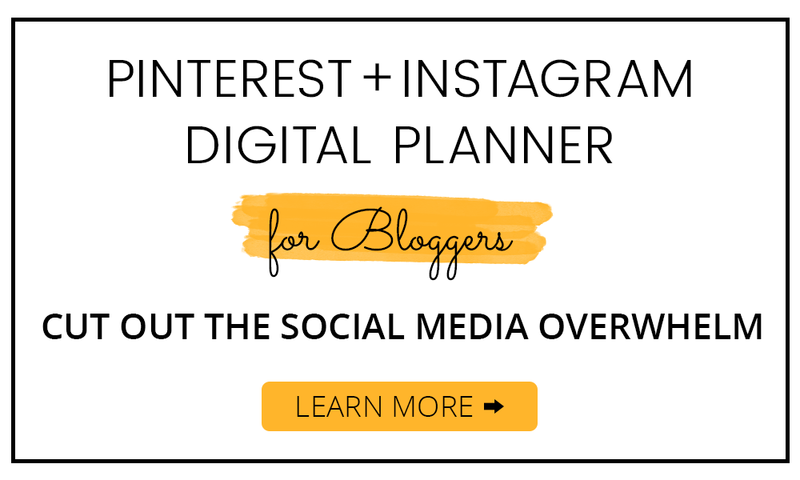 Find the very spreadsheet I use to help me spend less time on Instagram in my Social Media Planner for Bloggers! I came up with this little method to find hashtags a few weeks ago and it’s totally level-upped my hashtag game! On my laptop, I open the description I’m writing in Evernote and I set my iPhone next to my computer screen. 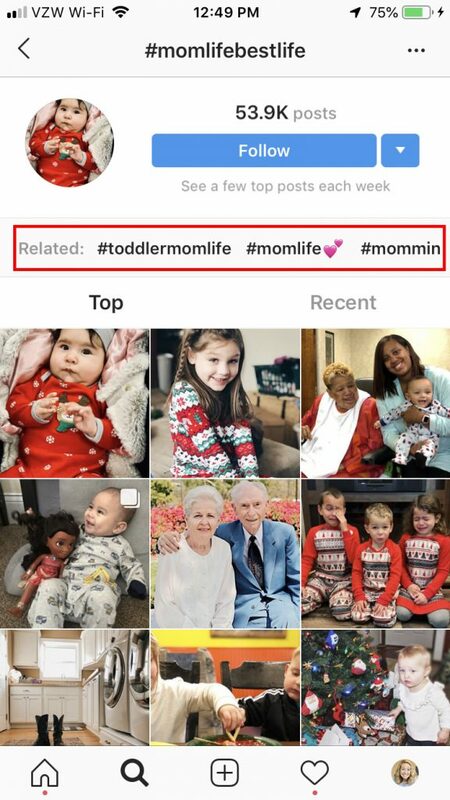 On my phone, I search for a hashtag on Instagram that I want to use. For example, #momlifebestlife. Along the top, it will give you related hashtags which I’ll add into my description I’m writing in Evernote. You can also click those hashtags to give you even more related ideas. I mostly use hashtags that have around 20k-90k posts, a few 100k-500k posts, and only 1-2 that have more than that if needed. I try stay away from those 1 million+ hashtags. Opting for the smaller hashtags actually helps make your content more visible! This method has helped me find better hashtags and saved me a ton of time finding them! Setting a screen time limit played a huuuge part in helping me spend less time on Instagram. At first, the idea of setting a daily time limit for Instagram was… scary. LOL. I didn’t want to feel limited and lack the time to share quality posts! Setting a limit actually did the exact opposite. The ‘Gram was taking up about 3 hours/day, so I decided to set my limit for 1.5 hours. It forced me to be more intentional about the time I was spending on Instagram instead of mindlessly scrolling. I was more focused when creating posts for my 2 accounts, participate in my engagement groups, and respond to all my comments and DM’s. When I’m tempted to open the app, I think, “Do I NEED to open Instagram right now?” Surprisingly, most of the time the answer is, “no.” I’m mostly tempted to open it when I get bored, or I’m waiting for Griffin’s naptime, or even just sitting a stoplight. All times when I should be more focused in the present. PLUS, the whole screen time thang kind of felt like a game! I didn’t want it to “beat” me, so I was more careful about the time I spent on it. When the app gave me my 5-minute warning at bedtime, it felt satisfying to sign off for the day. For OB’s Instagram, I do a mixture of photos and graphics. While I like to post “in the moment,” it helps to make up 9-10 of my graphics at a time so I have a library to choose from! It’s also way faster to make a bunch of graphics at once, while I’m in Photoshop, than going in and out of it 10 times when I need a new image. If you really like to plan, you can even plan out all your posts for the week or the month! Plan your photos and type out all your descriptions and hashtags in my social media planner or any other social media planning tool. I can’t believe I forgot this one – LOL. I was spending a good 15 minutes per post editing my photos and my profile grid still didn’t look cohesive. Once I started using the same preset on every photo, the editing process only took me about 5 minutes. For real! Check out how I use Lightroom mobile presets for Instagram. How do you spend less time on Instagram? How’s your Instagram usage? Are you waayyy overboard? 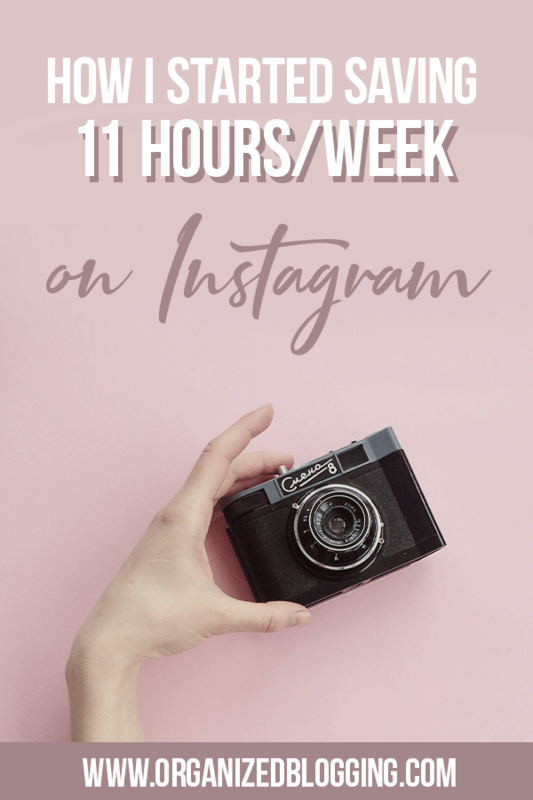 I’d love to learn any tips you have to spend less time on Instagram, so share ’em in the comments!